In the 1950s, in an effort to better understand group conflict, a team of psychologists nearly turned a summer camp into Lord of The Flies. The story of how and why it was so easy to turn normal boys into bloodthirsty, warring tribes (and how those tribes eventually reconciled and became peaceful thanks to brilliantly conceived cooperative exercises) can teach you a lot about a common mental phenomenon known as the illusion of asymmetric insight – something that helps keep you loyal to certain groups and alters the way you see outsiders. 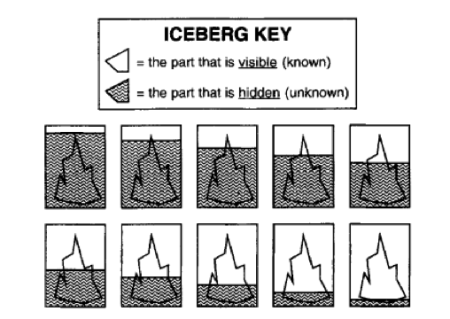 Later experiments revealed that if you imagine people’s inner lives as icebergs with some things showing above the surface and some things hidden from view, that you have a tendency to believe most of your iceberg is hidden, while everyone else’s is mostly visible. Scaled up, you also believe this about the groups, cultures, and nations to which you belong – yours are nuanced and complicated, theirs are simple and transparent (and dumb). This asymmetry of insight colors your interactions and decisions big and small. That’s what we explore in this inbetweenisode of the YANSS Podcast. Pronin, E., D. Y. Lin, and L. Ross. “The Bias Blind Spot: Perceptions of Bias in Self Versus Others.” Personality and Social Psychology Bulletin 28, no. 3 (2002): 369– 81. You: The Illusion of Asymmetric Insight.” Journal of Personality and Social Psychology 81, no. 4 (2001): 639– 56. Pronin, Emily, Thomas Gilovich, and Lee Ross. “Objectivity in the Eye of the Beholder: Divergent Perceptions of Bias in Self Versus Others.” Psychological Review 111, no. 3 (2004): 781– 99. Sherif, Muzafer, O. J. Harvey, B. Jack White, William R. Hood, and Carolyn W. Sherif. Intergroup Conflict and Cooperation: The Robbers Cave Experiment. Norman, OK: University Book Exchange, 1961.